The pension market in Ireland is continuing its inexorable shift from the traditional defined benefit (DB) to a defined contribution (DC) landscape. As the names suggest, DB looks to guarantee a benefit, or income in retirement, whilst DC only defines the contribution amount from the employer or employee. Therefore the actual outcome for a DC customer depends on a myriad of factors – investment time horizon, the contribution amount being made by the customer, the investment choice, and the level of risk that is taken via fund choice; to name but a few. The most popular funds in the Irish market currently for these DC investors are risk targeted funds, and for good reason – they are an easy concept to understand, they have scalable risk levels, and have a quantifiable, comparable metric to appraise funds from various providers. One of the biggest challenges to higher pension coverage in Ireland remains the lack of engagement from the public, and the subsequent inertia. With this in mind risk targeting funds play a vital role in improving this engagement and the communication with members. However, there is a concern that the risk conversation doesn’t go far enough. Risk, as measured by volatility, is but one tool or metric that goes into the formulation of an investment plan. Volatility measurement tells you about the movement of a unit price, but nothing about the direction of that price! 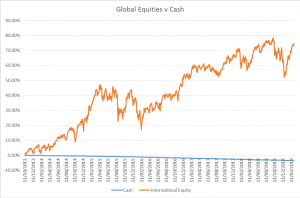 There is certainly price movements up and down in equities over this period, but they finish the period up over 70%, whilst cash on the under hand displays very low volatility, and moves in a steady fashion – downwards – to return more than -3.5% over the same period. This low cash rate is a function of the wider macroeconomic environment, and judging by recent ECB commentary, is unlikely to rise significantly in the near future. This is an important concept as most investors will apply a ‘risk premium’ to risk assets above cash. For example, the equity risk premium above cash is generally seen as 4-5%. This means if cash is returning 5%, you might expect, or be willing to take on equity risk, for a return of 10% – which to most investors seems a positive risk return trade off. However, with cash returns at negative levels, that puts the expected return from equities at closer to 5%, which doesn’t appear as attractive. Most investors are well aware that diversification and time are powerful weapons in their arsenal. However, staying the course during turbulent times can be difficult. As boxer Mike Tyson said “…everyone has a plan until they get punched in the face”. The sentiment rings true for investors as the best laid plans can be derailed during periods of heightened volatility. Fear is a powerful emotion that grips investors and causes irrational behaviour, which is why unit cost averaging is a viable alternative to a lump sum investment, or alternatively, a hybrid of both. With unit cost averaging, your regular monthly contribution buys units in a fund at the price on the day of purchase. So if markets have been falling for sustained period, the price of units will decrease which means that your fixed monetary amount is buying more units ever month. It can be tempting to try and time the entry and exits points. However, there is no evidence to prove that these peaks and troughs can be timed consistently. So, while you might get some calls right, the risk of missing the best market days has a material impact on your portfolio. With pension contributions, most investors will put money aside on a monthly or annual basis, dependent on their employment status. This lends itself naturally to utilising the concept of unit cost averaging, and can help to avoid some of the behavioural pitfalls mentioned above. Many traditional retirement strategies employed a ‘de-risk to retirement’ strategy, whereby investors moved to perceived lower risk assets as they approached their retirement age. This represented prudent investment sense, and still does, for investors looking to purchase an annuity at retirement. This annuity purchase signifies a ‘point in time’ purchase where short term volatility and fluctuations can have a detrimental effect on the future guaranteed income of a retiree. While this ‘de-risk’ approach still holds sway with large parts of the industry and investor psyche, the legislative environment has evolved and the introduction of the Approved Retirement Fund in 1999 gave a limited cohort of pension policyholders the option of continued investment into the post retirement space. Over the last twenty years this option has been widened considerably and is now available to the large majority of pension investors. With this evolution in mind the pitfalls of investment paralysis by volatility measurement become more acute. There are a number of key differences in terms of investment mindset in the pre-retirement ‘accumulation’ phase versus the post-retirement ‘decumulation’ phase, which are beyond the scope of this article, but your investment time horizon is conceivable 20 years either side of your retirement date. The jury is also still out in terms of identifying the best strategy for funding for your tax free lump sum, and this certainly warrants further consideration. However, the investment strategy for a client’s pension should certainly view the switch from DC to ARF as an event along the journey, rather than the destination. And the fund choice elected along the way should encompass this sentiment. A ‘de-risk’ to retirement age, merely to ‘up-risk’ once more into the ARF product makes very little investment sense. I have only touched on a couple of the main issues to consider when funding for retirement, but hopefully this article illustrates the need for ongoing advice in this area. Risk must go further than giving you a number on a 1-7 scale, as volatility measurement tells you very little about volatility management. We often highlight the risks of an equity based portfolio to an older client, but a cash based portfolio to a thirty year old represents a different, but by means no less destructive, hazard. As highlighted above, risk targeting funds serve a useful purpose in the market, but are not a substitute for a holistic financial plan. Unit cost averaging remains a great tool for retirement investing, and as one that occurs almost naturally through retirement investing, it should be fully utilised by investors. The same investors should also not have a plan through to ‘Normal Retirement Age’, but a plan through to late retirement and should invest through this ‘retirement barrier’. Pension investors have some key points on their side when it comes to attempting to have the best outcomes, some of these are listed above, and investors would do well to utilise them as much as they can – namely the ability to take sufficient risk, exploit the behavioural benefits of unit cost averaging, and the maintain the capacity to look through the retirement event in order to keep a longer term view.